As part of the University of Winnipeg’s series of Indigenous language events in honour of the UN International Year of Indigenous Languages, the Six Seasons of the Asiniskaw Īthiniwak Project will be presenting on the Asiniskaw Īthiniwak (Rocky Cree) language and giving a preview of the soon-to-be-released Pīsim Finds Her Miskanow picture book app at 12:30pm on March 28. This public event will take place in the University of Winnipeg Aboriginal Student Services Centre and will be followed by a feast. Six Seasons Story Team Co-Leader William Dumas will talk about the meanings and worldview embedded in the language of the Asiniskaw Īthiniwak. This will be followed by a preview of the Pīsim Finds Her Miskanow picture book app, which features a Rocky Cree translation of the original 2013 picture book. To close the event, UW student Cameron Adams will be doing a reading in Cree. This event is produced in partnership by The University of Winnipeg, Six Seasons of the Asiniskow Ithiniwak Project, and Manitoba Indigenous Cultural Education Centre. 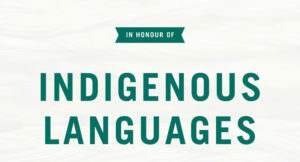 The University of Winnipeg is pleased to hold these events and more in honour of Indigenous Languages, and in acknowledgement of 2019 being the International Year of Indigenous Languages as declared by the United Nations (IY2019) to help preserve indigenous languages and safeguard the rights of those who speak them.